There are a lot of new fan coming out from recognized brands like Corsair and NZXT, and they sell them as their high-end premium fan but does they make any difference to your PC? And is it worth investing in some of these fan? Or you should not care them about at all. Well to find this out we must look at what best 120mm case fan can do. 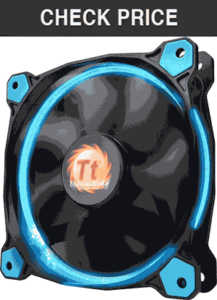 In this article, we will take a look at the best 120mm case fan you can get for your computer. We will also help you get through the features of each fan to help you choose you to choose a fan even better. 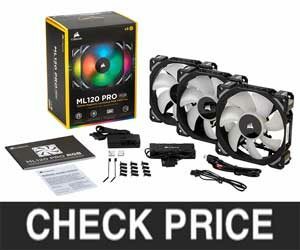 The Corsair ML120PR0 best quality 120mm case fan you can get. These fan not only look great, but they also perform well and fan have magnetic bearings which makes them better than other fan and long-lasting. These fan come in 4 different colors, White, red, blue, and black. You can also customize the fan RPM, you can go as low as 400 RPM to all the way to 2400 RPM, and these are one of the most silent case fan you can get. Now, if you are looking for the best case fan then give them a try. These Corsair AF120 series of fan come in almost any colour LED light, from purple to white to no light at all. These fan are made for high air volume cooling they are made to perform well, and you can enjoy intensive gaming without worrying about your gaming rig getting heats up. The ultra-thin blades help reduce the fan noise, and whatever your colour choice is, you will find them with the AF120 series fan. 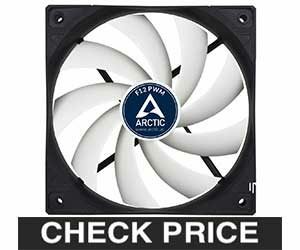 So if you want more value for money case fan then take a look at Corsair AF120. After Corsair, Cooler Master is another brand when it comes to Gaming pc components. The SicleFlow 120 case fan from Corsair provide high performance and features blue LED lights, but there are a variety of other colours for you to choose from. 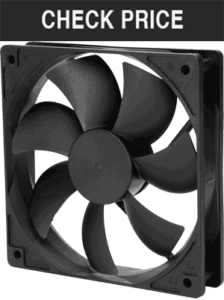 These fan can go to a max RPM of 2000 and also produce less noise. The cooler master also guarantees 50,000 hours of gaming life with these fan so you should go for them if you need a very long lasting case fan. The Jetflo Series from the Cooler Master is designed to save space so even if you have a smaller computer case then the fan is perfect for you. The Jetflo has a right amount of airflow despite its small size and the RPM ranges from 800-2000. These fan are also durable and can resist dust and water damage. The Jetflo can be a little louder, but it outperforms other fan in every other area. So if you are looking for small long-lasting fan then go for the Cooler Master Jetflo 120. The Arctic F12 not only keeps your system cool but they also remain quiet all the time during their seamless operation. These fan have fluid dynamic bearings which makes them long lasting and will last you for years. The RPM ranges from 500 to 1350 and allows two-way installation. 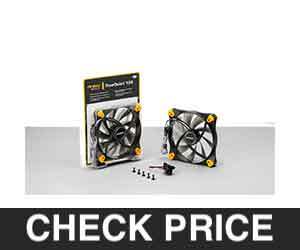 These fan will surely not cool your system as its name suggest but having a low price they are worth giving a try. INNOVATIVE DESIGN ENABLES QUIET AND EFFICIENT VENTILATION: The innovative design of the fan blades improves the airflow and facilitates highly efficient ventilation. The impeller was designed with a focus on minimizing the noise level yet delivering the desired airflow and pressure. LONG SERVICE LIFE: The Fluid Dynamic Bearing comes with an oil capsule that avoids lubricant leakage. Thus this bearing is as quiet as a sleeve bearing but comes with significantly higher service life. The Thermaltake luna is one of the best looking 120mm case fan, and they also perform well. It comes with an anti-vibration mounting system which eliminates the vibrations which not only produces noise but can also damage some components. They feature Hydraulic bearing which offers silent operation and makes the fan long lasting. The Luna series from Thermaltake is an excellent quality fan which also stylish and comes in a variety of colours. interference-free Design: With 15mm thickness, Luna 12 Slim LED fan can be mounted on the ultra thick radiator in PC cases with limited space where a regular 25mm thick fan can’t support. Outstanding Performance, Less Noise: Enlarged fan frame opening enhances air flow with a fan speed of up to 1400 RPM. Double-curved nine fan blades deliver exceptional static pressure at a low noise level of 24 dBA. Anti-vibration Mounting System: In-mold injection anti-vibration rubber pads provide hassle-free usage for 80% protection coverage, including all four corners and the frame. Hydraulic Bearing Offers Silent Operation and Longer Lifespan: Hydraulic bearing self lubricates with high quality, friction reducing substance which lowers operating noise and improves efficiency. The seal cap prevents leakage and improves the lifespan. 3 Colours of Luminous LED: The Luna 12 Slim LED series is available in three vivid colours: red, white, and blue. Embellish the chassis in your way! These fan come in a few dull colors and are not attractive at all, but they do all the other things just right. These are silent and packed with some great features. RPM goes up to 2000 and still provide noiseless operation. It features Silicone anti-Vibration pads AAO frame and Flow Acceleration Channel. So if you are looking for one not so attractive fan with great features and value for money, then Noctua NF120 will be your bet. Another Unique looking fan from Antec and features a two-way switch which allows you to select fan speed and easy control of its performance. The RPM can go as well as 600 but doesn’t go as high as other fan in the same price range, they go a max RPM of 1000. It features thin fan blades and silicone government which reduces the turbulence and noise. These fan are also easy to mount with its toothless mounting screw while this fan comes in only dark grey colour but it will look good in any kind of the build. 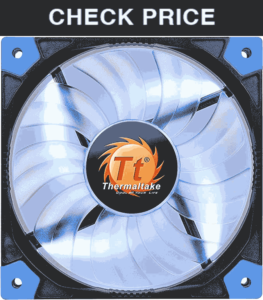 The Riing Series from Thermaltake comes at a great price and provide great performance. It features blue LED lights and a unique design. The LED lights are fixed in a form of Ring and the light shines from the corner, not like the fan who’s light shines inward. These come in a wide variety of LED options and includes white, blue, red, and green. These not only look good but also gives superb performance just like any other Thermaltake product. The bearings are also to reduce the noise level even further and increase efficiency. The Max speed of this fan is 1500 RPM and you should definitely go for them if you need a fan with a great price to ratio. Concentrated compression blades (CCB) is engineered to focus the inner weaker circle of Air outwards, allowing the outer section to pressurize and compress the Air. Hydraulic Bearing/Low-Noise design lowers operating noise and improves efficiency. The Low-Noise cable can reduce the noise level by 24% from 24.6dBA to 18.7dBA. Anti-vibration mounting system equipped with In-mold injection anti-vibration rubber pads provides Hassle-Free usage for 80% protection coverage, including all four corners. The Rosewell fan features a sleek black design which will easily blend with your black case. These come in a pack of four and are as high quality as you get from any other brand like Corsair or Cooler Master. The noise level is also low, and the RPM ranges from 1100 to 1300. 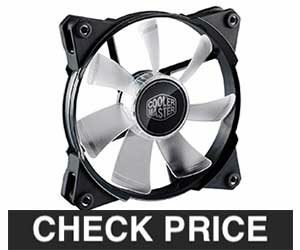 Now if you are looking for a cheap aftermarket fan which will also last long then get the four pack Rosewill Long Life. What Computer Case Fan do? fan cool your pc when you mount them on your case their bring cooler air in and exhaust hot air out. This depends on the case you are using, but the most common way is to bring the cool air from the bottom then venting it at the top. In theory, this is the most effective way to do because heat naturally rises. The more fan you install in your case, the cooler your pc will be. You also got different sizes of the fan, and the most common ones are 120mm and 140mm. The fan also do come in a few varieties: mainly Airflow optimized fan, and static pressure optimized fan. Enough said about the fan now let’s see are they worth to upgrade? 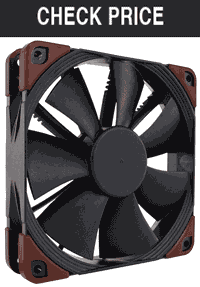 Should you upgrade to 120mm case Fan? Doing intense gaming will heat your computer and if you don’t have proper components to cool down your pc then your system will get overheated and will throttle its performance, and in the worse case, your pc might crash. You can easily overcome this problem if you have a good case fan. fan are an important part of your gaming system, and without having them your pc components might get heats up, and at the end, it will harm your gaming system. fan are not all made equal, and you get a various variety of fan. 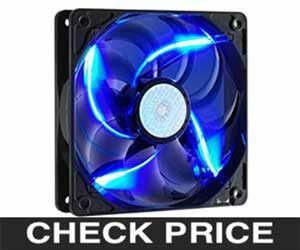 Some fan are made n the cheap and some are made on the luxury side, but If you buy a cheap computer case, then you will probably get some cheap case fan with it then you should think about investing in a premium fan. So here is our final list of top 10 best computer case fan you can buy in 2019. 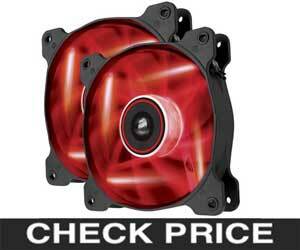 I hope this article was helpful for you to choose Best 120mm case fan for your pc. If you have any doubts with the fan listed above, feel free to comment below. I will make sure that I help you to the best of my knowledge. If you have found other fan which are worth including in the list, then you can comment them below, and I will add them in the post.